The La Quinta Inn & Suites San Antonio Airport has been awarded the 2016 TripAdvisor Certificate of Excellence award. Samsung Flat-panel TVs with 30 channels of HD programming. Easy-access Plug-and-Play feature makes it simple to connect electronics. 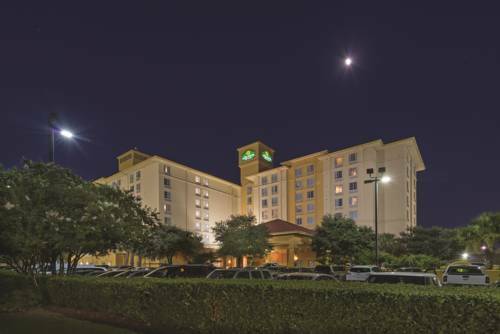 The La Quinta Inn & Suites San Antonio Airport is less than a mile south of San Antonio International. With easy freeway access, you are only minutes from all downtown attractions, including The Alamo, Riverwalk, Six Flags Fiesta Texas, Sea World, SBC Center, the Alamo Dome, Brackenridge Park, Alamo Heights TX, and the San Antonio Zoo. It's a mile to North Star Mall, and the Quarry Golf Course. The beautiful La Quinta Inn & Suites San Antonio Airport has lots to offer. All spacious standard rooms come with free wireless high-speed Internet access, a microwave, and refrigerator. King and Suite guest rooms also have a cordless phone with two lines, and a high back chair for the large work desk. We have 2,500 square feet of versatile meeting space that can accommodate 100 people. Enjoy our well-equipped fitness center, relaxing outdoor swimming pool, and sundeck with a separate courtyard where you can relax among the vibrant landscaping. Our Free Hot Breakfast is served each morning in the lobby. Located in North Central San Antonio on the southwest corner of I-410 and US 281, we have a free shuttle to the airport, malls, restaurants and other venues within two miles of the hotel. We are also convenient for visitors of Clear Channel, HEB, and Valero Corporate Headquarters. Reservations not guaranteed to a major credit card will be canceled at 6pm day of arrival. Guaranteed reservations must be canceled 24 hours prior to arrival time of the scheduled date of arrival to avoid being charged one night's room rate plus all taxes.